Travelon claims to deliver just what I need with this small nylon purse of the same name. And reluctantly, I'm forced to admit that it's probably right. I might wish for luxury, style, and ample space for toting everything from magazines to cameras, but they're really not the things I need at all. If we're looking at what's essential, then the durable nylon body and functionally designed interior really do have us covered. It is a very small bag, but with three separate compartments and a whopping ten pockets it feels a bit bigger than it actually is. And that's not even counting all the card and ID slots either. The third compartment is expandable too in case you need a little extra storage space. The only disappoint is the skinny little strap. I wonder how long it will last if the bag is filled to the brim. Even if it does hold, I'm sure it'll dig into your skin and make marks by the end of the day. At least it's adjustable though, so you can wear it as a shoulder bag or a cross-body. For $29.99 Travelon might not give you everything you want here, but they do offer everything you really need. 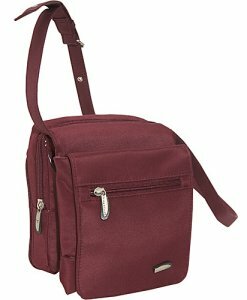 The Travelon Messenger Shoulder bag, a great alternative to this cross-body bag.